I love working on these extremely old thick agaves. This one has a huge turquoise inlay where a Gila woodpecker must have found an afternoon meal. One of the reasons I love these old stalks so much is you see the evidence of birds, insects, and the extreme desert climate and you think of the stalks story. I have really been into these smaller didges lately as I love these higher pitches and F has always been one of my favorite notes. This one would be best for someone who has a bit more experience playing as the higher pitches require a bit more control. I love these open bore didges for my style of play which is combination of ambient and rhythmic. This bore size really excels at both styles and has a nice amount of bass added into the drone and a bass drum hidden within too! Really nice volume and solid overtones and great vocal ability. 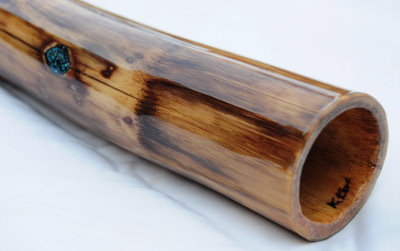 This could be a great didge for sound healing or in situations where the player has to move with the didge with its size. At the reiki circle I have played at a few times F has always been the most popular note and always makes me feel great to play too. 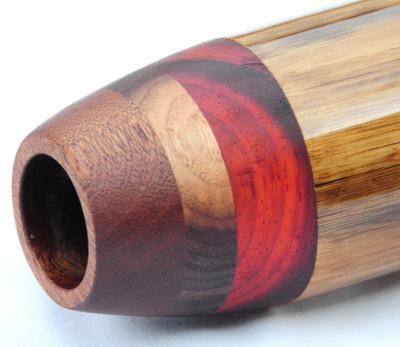 An awesome little didge! !